Radioanalytical chemistry concentrates on the analysis of sample for their radionuclide content. Different processes are used to purify and recognize the radioelement of interest via chemical processes and sample measurement methods. Marie Curie initially developed the field of radio analytical chemistry, though, Ernest Rutherford and Frederick Soddy made tangible contribution to this field of study. They developed separation and radiation measurement methods on terrestrial radioactive substances. From Curie's time, the applications of radioanalytical chemistry have since proliferated and lately, researchers have apply chemistry and also nuclear procedures to explain nuclear properties and reactions, utilized radioactive substances as tracers, and measure radionuclides in numerous different kinds of samples. The applications of radio-analytical chemistry comprise: forming and characterizing new elements, finding out the age of materials, and making radioactive reagents for particular tracer use in tissues and organs. The recognition and measurement of radionuclides is chiefly based on examining the emitted rays or particles. Some of the fundamental understanding of the interaction of such emissions by other materials is significant not only for dealing by radiation detectors however radiation protection. Interaction by matter comprises a transfer of energy to atoms and molecules. This interaction can cause ionization or excitation or both. The interaction depends on the kind of particles or photons and energy of radiation and also on the properties of matter. The thickness of a radiation absorbing material is of interest and is provided in surface density or weight per unit area (mg/cm2). Alpha-particles, encompassing a rather high mass and a double electrical charge lose their energy fast as they pass via matter and leave a dense trail of ionized material all along their way. The range of alpha particles in matter is small (that is, a few centimeters in air); however the energy transfer is extremely high, because all the energy is discharged in a short distance. Alpha-particles from particular radionuclide encompass a definite energy and a definite range in matter. A certain thickness of the shielding material is just capable to stop alpha-particles of a corresponding energy. Beta particles having a single electrical charge and a much lower mass as compare to the alpha particles are much more readily deflected through collisions by atoms and molecules. Beta particles encompass a maximum range in matter. For beta particles of a particular initial energy, there is for all time a defined thickness of shielding material that can stop such beta particles fully. The range of a beta-particle of 1MeV initial energy is around 3m in air or 4mm in water or animal tissue. Gamma-and x-ray photons are much more penetrating as compare to particulate radiations of the similar energy, because of instead low interaction with matter. The absorption of gamma or x-ray photons is a complex method and the method based on the photon energy, atomic number and the density of the absorbing materials. The most significant feature of interaction with matter at low energy is what is termed as photo effect. The energy of a photon is transformed to the kinetic of an orbital electron that is ejected from an atomic shell through interaction of the photon. The kinetic energy of this photo electron corresponds to the energy of the gamma-photon minus the binding energy by which the electron was held initially in the electron structure of the molecules. The photoelectron will disperse its energy in to matter identical to a beta-particle. Compton scattering is the other method through which gamma-photons lose their energy. Only a part of the photon energy in this case, is transformed to kinetic energy of an electron. The rest remains in the form of a scattered gamma-photon of lower energy which might experience interactions by different atomic shells, generating a photo electron or the other Compton electron. The Compton electrons will interact with matter identical to a beta particle. Compton scattering is a more significant method at higher photon energy. The gaseous ionization detectors collect and record the electrons freed from gaseous atoms and molecules via the interaction of radiation discharged by the source. 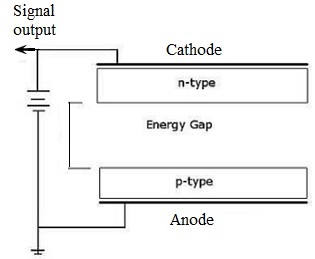 A voltage potential is applied between the two electrodes in a sealed system. As the gaseous atoms are ionized after they interact by radiation they are attracted to the anode that generates a signal. The applied voltage is varied in such a way that the response falls in a critical proportional range. The operating principle of Semiconductor detectors is identical to gas ionization detectors expect rather than ionization gas atoms, free electrons and holes are generated that make a signal at the electrodes. The benefit of solid state detectors is the greater resolution of the resulting energy spectrum. Generally NaI(Tl) detectors are employed; for more accurate applications Ge(Li) and Si(Li) detectors have been developed. For additional sensitive measurements high-pure germanium detectors are employed under a liquid nitrogen atmosphere. Scintillation detectors use a photo luminescent source (like ZnS) that interacts with radiation. Whenever a radioactive particle decays and hits the photo luminescent material a photon is discharged. This photon is multiplied in a photomultiplier tube that transforms light into an electrical signal. This signal is then processed and transformed into a channel. By comparing the number of counts to the energy level (generally in keV or MeV) the kind of decay can be found out. Samples having very low concentrations are hard to measure precisely because of the radioactive atoms unexpectedly depositing on surfaces. Sample loss at trace levels might be because of adhesion to container walls and filter surface sites via ionic or electrostatic adsorption and also metal foils and glass slides. Sample loss is an ever present concern, particularly at the starting of the analysis path where sequential steps might compound such losses. Different solutions are known to circumvent these losses that comprise adding an inactive carrier or adding a tracer. Research consists of as well illustrated that that pretreatment of glassware and plastic surfaces can decrease radionuclide sorption via saturating the sites. Because of the inherent nature of radionuclides resulting low concentrations a common method to enhance yields is the addition of carrier ions or tracers. Isotope dilution comprises the addition of a known amount of radionuclide tracer to the sample which includes a known stable element. This is done at the beginning of the analysis procedure thus once the final measurements are taken, sample loss is considered. This method avoids the requirement for any quantitative recovery that greatly simplifies the analytical method. Carrier addition is the reverse method of tracer addition. Rather than isotope dilution, a known mass of stable carrier ion is added to radionuclide sample solution. The carrier reagent should be calibrated prior to addition to the sample. To confirm the resulting measurements, the expected 100 percent yield is compared to the actual yield. Any loss in yield is analogous to any losses in the radioactive sample. Generally the amount of carrier added is conventionally chosen for the ease of weighing in such a way that the precision of the resultant weight is within 1%. For alpha particles, special methods should be applied to get the required thin sample sources.